I am working on an article about social media and its effect on teenagers, specifically teenage girls. 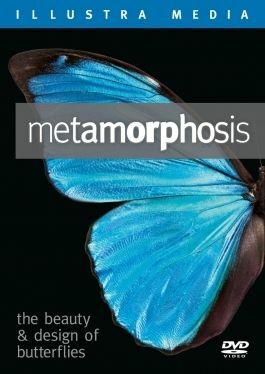 I was talking to one of my daughter's friends and a few of the things she said about her journey trying to let go of social media and some of the pitfalls, got me to thinking about my life and my blog. She talked about feeling almost constantly judged. People making mean comments or being snarky if they didn't like what she was wearing, or if they disagreed with her opinion on something. She talked about seeing these pictures of other people's lives and knowing that they were having a lot more fun than her. I tell my big kids all the time not to believe what they see on the internet. And I am not just talking about about news stories. I don't want them to think that everyone else is having fun, fantastic times and going out all the time. It sure can look like that though, since everybody posts every little thing about their lives. But, a lot of it isn't real. Do I actually show you my real life? Should I show you the real in my life? I am in the middle of my rock and hard place. I want to keep some privacy for the family, but I also want our stories out there. I want my family and friends that no longer live near us to feel like they are getting a glimpse of the people my kids are turning into. But, I don't want creeps looking at my site or my pictures and being able to find us because I have been so open. I want to be real and relatable. I do. I want to be able to be an encouragement to other moms...homeschooling moms....moms with big families.....moms that don't live near family members. But, I have to be honest, I carefully select the reality that I share with you all. So, yes, I have been transparent.......sort of. I have shown you how messy my house gets here and here, but, have I told you that it looks like that more often than not? I love Rainman. I really do. He is an awesome human being. But, I haven't really told you that he is annoying and gross sometimes. I have told you that in general terms. I have shared that nobody ever told me that there would be times that I wouldn't actually "like" the man I married. We do not have a perfect marriage. It is not idyllic and romantic. It is a constant dance of our own selifsh desires and actions, versus what will make the other person happy. As I am typing this, I am thinking....oh man....now they will know what a jerk I am....how selfish I can be. That sometimes, I sit in my chair and hope against all hope that Rainman will take us out to dinner, so I don't have to get up and cook. Because, I just don't feel like it. No good reason. I just don't want to do it. So, yeah, what you see on my blog is my life....sort of. It is the carefully selected pictures and stories that I will allow you to see. I guess that happens in real life too though. We all have a "mom" voice that we use at the grocery store that is different than the voice that is used when rapping on the kitchen window when you see them doing something dumb in the backyard. It is just that by having a blog I am inviting more actual strangers in to take a look. I love my kids....more than I can truly describe to you. But, ugg.....they do some...as Rainman would call them....boneheaded things. Then they get yelled at. Then they cry. I usually don't tell you those stories on here. Like the story of them playing catch with an open box of Cheerios in the kitchen. Yes, no surprise here.....It ended badly. That time though, Rainman did the yelling. S-girl did the crying. A-man did the flustered explanation of what they were thinking (Spoiler Alert: They weren't). And, the two of them did the cleaning up, while the other children passed judgment on them with snide remarks. Which then escalated to both Rainman and I yelling at the rest of the kids to knock it off because they weren't helping and did they want us to remind them of the last boneheaded thing they did and got in trouble for?!? It is NEVER dull here, that is for sure. We ended up with 5 extra kids at our house a few days ago....all aged 6 and under. So, we had 11 kids here and 2 parents. It was actually a really good day. Everyone had fun. Only a few tears and boo-boos. All in all, it was a good day. I was exhausted when it ended and happy to see the extra kids go back home with their parents. The next day, S-girl said to me, "Wouldn't it be great if we had 11 kids everyday mom? Then we could have our own t.v. show and everything!" Fear that I won't be liked. On a side note: There is "sort of" a version of us on T.V. already. We have started watching The Willis Family on TLC and take away the musical and dancing careers (LOL), that is pretty much how our family looks and runs behind the scenes. Really. 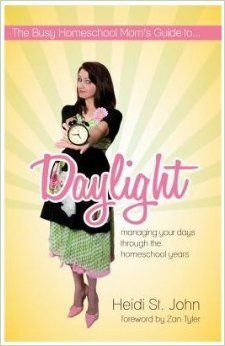 But, again, comparison rears its ugly head and I think, "Why haven't our kids taken more advantage of the fact that we homeschool? Why haven't they taken up song writing? Why haven't they won dance competitions? Why are my kids so.....normal....and average?" We can't help but compare ourselves to others. It is normal. It is human. It is dangerous. I tell my kids that ALL THE TIME. But, we grown ups need the reminder too. I need that reminder. We all need to remember that what you are comparing yourself to is often a carefully constructed version of the truth. Not a lie. But, not quite the full truth either. 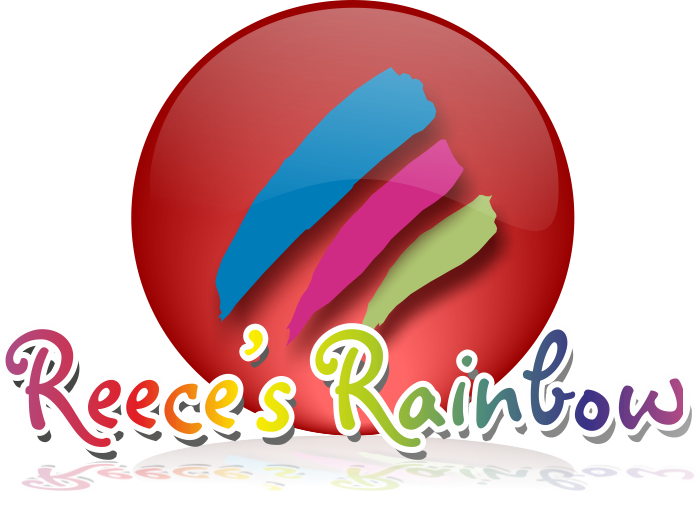 Like my blog. I have an article coming up next month for Home & School Mosaics about rejecting being "Pinterest Shamed" for my summer with the kids. I think I can take that to a whole other level with refusing to be "Life Shamed" by other people's lives. To go ahead and take glimpses of their lives and enjoy seeing them. To take ideas from what they are doing and trying with their family, but not think we are total losers if we don't operate the way they do. I follow some awesome blogs. There are life ones like Come Home To Roost. She has awesome, beautiful children and takes amazing pictures. But, if I am not careful, I end up comparing myself and thinking things like...."She is so skinny. She has 7 kids and looks like that?!? What is wrong with me?!?!?" There are organizing/home ones like Sunny Side Up. She is also another slim mom that takes great pictures, and she also has a brand new house that is becoming wonderfully organized. If I am not careful, I could look around her world and compare myself. I wouldn't come out on top. There are crafting and creating blogs that I follow, like Whatever. 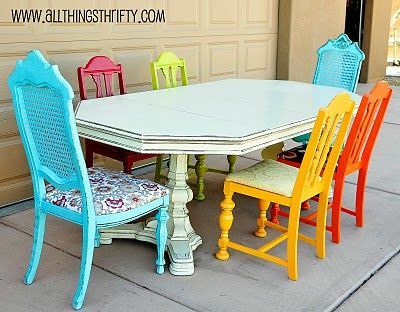 Another slim mom that takes beautiful pictures that decorates with colorful, fun stuff. I think you are already getting to know my style of comparison, right? My weak spots. Having a blog is being part of a strange dance I am choosing to participate in. I have a blog for a few reasons. One of them is truly to keep my family and friends who now live thousands of miles away involved in what we are doing. 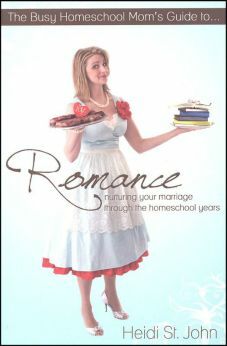 I also blog so I can get some homeschool curriculum for free by being a reviewer. But, honestly, my other reasons are more selfish. I want to have readership. I want followers. I want to be a writer. There, I said it. I want to turn writing into a job and make a little money on my blog. So, I have to put things out there, that maybe I wouldn't normally tell a stranger. What you are seeing here is reality. But, it is a small slice of our life. A small percentage of the picture. Not to say that what you see isn't real. It is. There is a LOT more to us than what you see here. Some good. Some bad. Just like with the blogs I follow and have to fight the urge to compare myself too. I am just seeing a small little slice of their lives too. It is not as idyllic as it seems. We all have to remember that just like movies and t.v. shows are....edited/more perfect/comical... versions of reality....so, is my blog. This is my Goldberg's version of our life. All based on truth, but prettied up a bit for your viewing pleasure. Ha! So, if you ever find yourself comparing yourselves to me, my family, my marriage, my way of homeschooling and feel like you don't measure up and you aren't....enough. Don't do it. You are enough. You are your perfect version of....you.....and so am I. May 22nd has been a weird day for me, for a long time. Normally....especially in Minnesota.....the end of May is a joyous time because spring has finally sprung and things are warming up and all of that jazz. May weather is very different here in Georgia...all that spring has sprung stuff starts back in February. But, May 22nd is still a weird day for me, because.....this was my son. I have moved on from the mind numbing grief. I truly have joy filled days in my life. But, every May 22nd, I can't help but wonder what our lives would have been like if Stevie had lived. He would have been 16 this year and driving. It is when I start thinking about stuff like that that it gets weird.... and, yes, sad. The kids all know about their brother and we talk about him and the other brothers and sisters that they have lost. 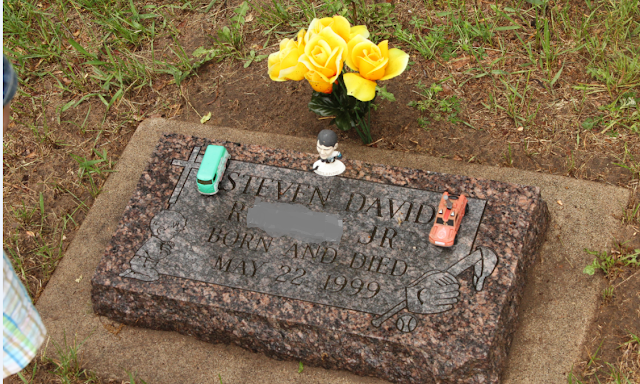 We visit his grave when we go up to Minnesota for visits. The kids talk about how cool it would be to have 10 kids in our family instead of 6, if I hadn't had the other miscarriages with Peanut Baby and the twins, in addition to Stevie. In their minds, that would basically mean we would have our own reality t.v. show though! I don't have anything profound to end this post with either. Other than the fact that Stevie is the reason that I was okay going on and having 6 kids, and I would have more. Because Stevie showed me that life is a miracle and yes..... a gift.... that should be freely accepted and enjoyed as long as you can. I never wanted to say no to that gift. So, I didn't. I won't. I hesitated to even post this. Too personal. Too hard to fit into a neat little box of types of posts. But I am working on an article about the unrealistic/unattainable ideas we are sending out into the world with our "everything is perfect and wonderful in my life" posts. So, I am trying to be transparent and not just show the good side of everything. My life has been wonderful, but moments have certainly not been perfect. So, here is my moment of transparency for the day. I am a little sad today. We got to choose from a list of available titles. We chose this one called Torchlighters: The Story of John Wesley. FishFlix.com is probably self explanatory for most Christians. Christian fish symbol....you know?!? But, in case you haven't had your coffee yet this morning, it is a website that has Christian movie titles (flix) available that you can watch just for fun, or incorporate into your studies. They have all sorts of different titles available, like wholesome romances like When Calls the Heart to Tim Hawkins comedy DVDs to nature and creation DVDs. 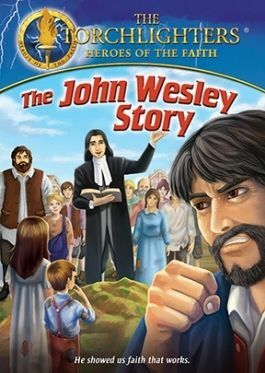 The John Wesley movie was part of the Torchlighters series which are movies designed for kids ages 8-12 and tells the stories of men and women throughout history that have served God. We were interested in the John Wesley story because I was raised a United Methodist and the kids and I are currently members of a United Methodist church. We knew that John Wesley founded our denomination, but didn't know much else about him. When we first started attending this church, my older kids went through confirmation and part of that was a weekend in St. Simon's Island - Epworth by the Sea area where there are statues of him preaching. 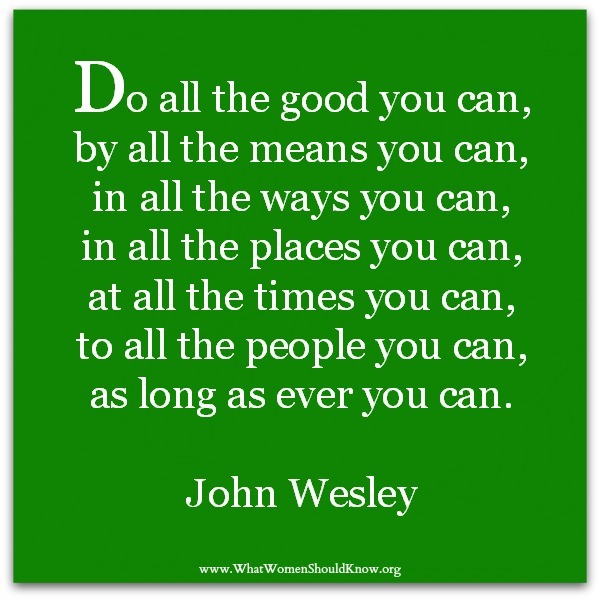 The only other thing we knew was that a quote from John Wesley was painted on the walls in the youth room at church. But, that was really all we knew about him. Oh, and his brother Charles wrote some of the hymns we sing. That is pretty much it. So, we were all kind of interested to see what we could learn about him in the quick 30 minutes-ish movie. So, A-man, S-girl, V-girl and I sat down to watch the movie together. I had an uncomfortable feeling for about the first half of the movie though. John was shown a a child almost dying in the fire and being saved at the last minute. His mom says that God saved him from the fire, like a "brand plucked from the burning" because He has a special plan for John's life. (No pressure or anything, John!) The movie them moves into John's adulthood where he is shown trying to preach and convert people and, honestly, he was sort of a jerk. Pompous and pious and just trying to convert people to pay God back for saving him in a fire when he was little. In my head I was thinking...this is sending the total wrong message! You don't just continue to shove the gospel down people's throats. You don't just try to be a good person. You don't just try to be good enough to earn God's approval. I was uncomfortable, but I kept my thoughts to myself as we watched the movie. Good thing I did, because John had an epiphany and a change of heart/attitude and starts trying to preach and teach in a new way. However, the existing churches wanted nothing to do with him...or the way he was saying that they were all sinners (gasp!). There were even scenes of him being physically removed from churches and told not to come back! All of this drama and excitement in a 30 minute, animated kids movie! It really had a good message about not just being able to rely on yourself and be a good person to get in God's good graces and buy a place into heaven. It talks about everyone being a sinner. Everyone needing God's freely given grace. Everyone having a purpose on earth. And, about everyone doing good....not just to be good enough for God, but because it is the right thing to do...and it let's God use us. Overall, I was super happy with the John Wesley story and it gave the kids and I lots of things to talk about afterwards, including how even though John was doing good and seemingly right things, he wasn't allowing himself to do things in a way that God wanted....with the people that God wanted him serving....so, he wasn't really doing much good....even though the stuff he was doing was good. Lots of good discussion opportunities for the kids and I! For us, it was especially meaningful because of our background as Methodists. I am even going to suggest this movie to our Sunday School director and our Youth Leader for the students to watch. In addition to the bonus documentary on John Wesley, there was also PDF study guides with questions and activities, so that could easily be used in this type of setting. But, really I can see the whole Torchlighters series being good to show the different people of faith and how they came to truly be doing and saying what God intended for their lives! The John Wesley movie is available for $9.99 along with many, many other titles from FishFlix.com. If you spend $35, you get free shipping too! You can get a 10% discount on your order, if you sign up for their free newsletter. The TOS review crew got lots of other "flix" to choose from, so see what they thought of their selections. This is one of my favorite times of the year to be a homeschooler. I am writing over and Home and School Mosaics today and I will explain to you how we manage to finish the year strong, and still have time for......well, let's say get outside and enjoy the weather. Cute, cute, cute, little book from WordsBright called S is for Smiling Sunrise, An Alphabet Book of Goodness, Beauty, and Wonder. This was a super easy review for us to do....even at the end of our school year when the kids are sort of sick of....."school". It is intended for Pre-K up through 3rd grade. It was written by a dad (Vick Wadhwa) after he got bored with his daughter's normal alphabet books. Get this....for his real job, he is a scientist with a Ph.D. in pharmaceutical chemistry! We would love him here at our place...he would fit right in with my smarties/nerds. And, they recruit anyone and everyone they can to join them.....including poor, unsuspecting neighbors and their friends. S-girl LOVES to be in charge and be the mom/teacher. A is for Artwork! Drawing and painting. Singing and dancing too. Art makes life interesting! B is for Butterflies flying in a flutter. Did you know, that their wings are soft like butter? Cute, right? Some of the phrases that go with the words read a little awkwardly, not quite poetically, but that didn't really bug me too much. This book is a fun little read. Not necessarily a read alone for your younger kids because while most of the A-B-C words themselves are easy, the other poetic descriptions have harder words in them. Like, F is for Flowers! But, you need to be a slightly more advanced reader for the rest: Fragrant and beautiful. Look and pause, be here now. Be happy and peaceful! Or I is for Infant. Sleeping peacefully. Potential for greatness resting gracefully! Cute picture. Nice sentiment. Slightly hard "I" word.....and slightly hard poem. So, while it might hold your little ones interest as a picture book, this is definitely a book that you will want to read to them yourself (or by a slightly older sibling that is feeling grown up!). There is a teacher's guide that goes along with the book and gives you questions to ask or discussions to start while reading the book, but I will be honest.....we didn't use it. I don't like to "do" too much or sometimes they suspect we are trying to teach them stuff and they get stubborn....if you know what I mean?!?! That said, if I were to use this in an actual classroom, I would definitely see using the discussion questions and activities recommended. But for us and our "classroom" (even the innocent bystanders) we did fine reading it and talking about it on our own without that extra help. I loved the K page.....because.....awesome word.....and you hardly ever see them anymore. It made me happy. That is all. But, have a new reader try to sound that word out! X, as usual, was a tricky word....and didn't actually use a word that started with X. For this book, the word is eXcellence, aiming for the sky. Reaching within, for your best. Growing deep and high! I liked looking at the book because of the cute, smiling sunrise guy. Made me want to paint him on my bathroom wall...or something! This was a quiet, sweet little children's book that gets you beyond the normal A-B-C books that are out there. It would make a great gift for a new mom or teacher. 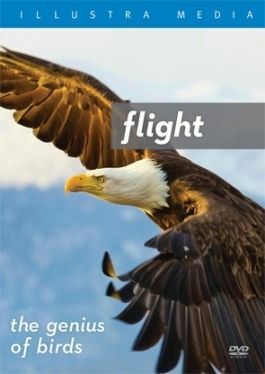 Pricing and purchase information is available over at WordsBright's website. 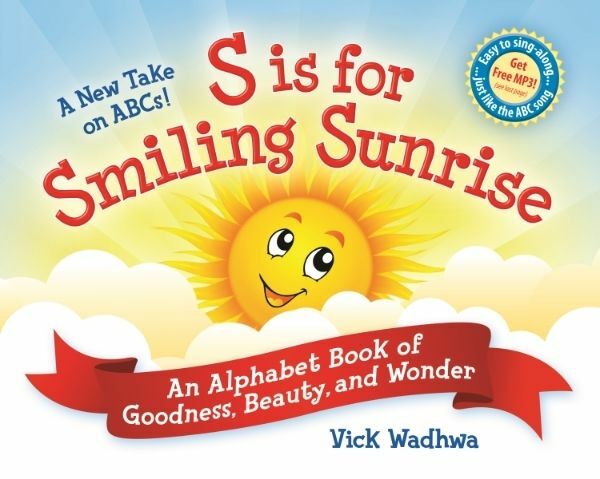 See what other TOS Reviewers thought of this totally cute kids book.....S is for Smiling Sunrise! We got the chance to try a really interesting math curriculum from A+ Interactive Math. 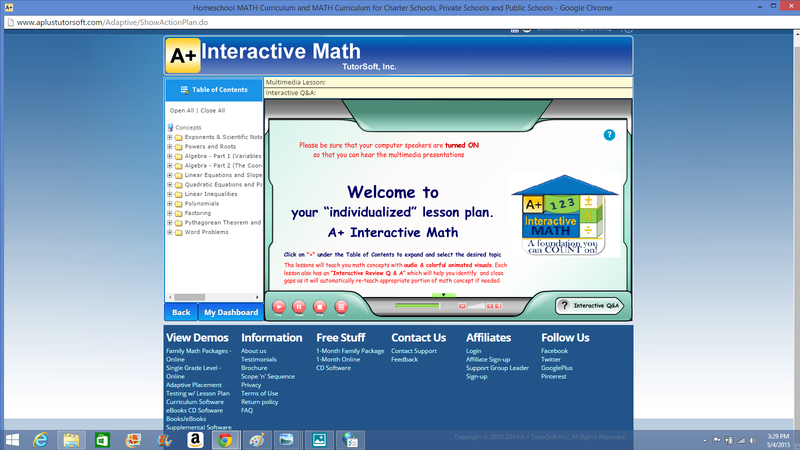 It was called Adaptive Placement Test and Individualized Lesson Plan. It is a 3 month subscription program for the test and lesson plan. 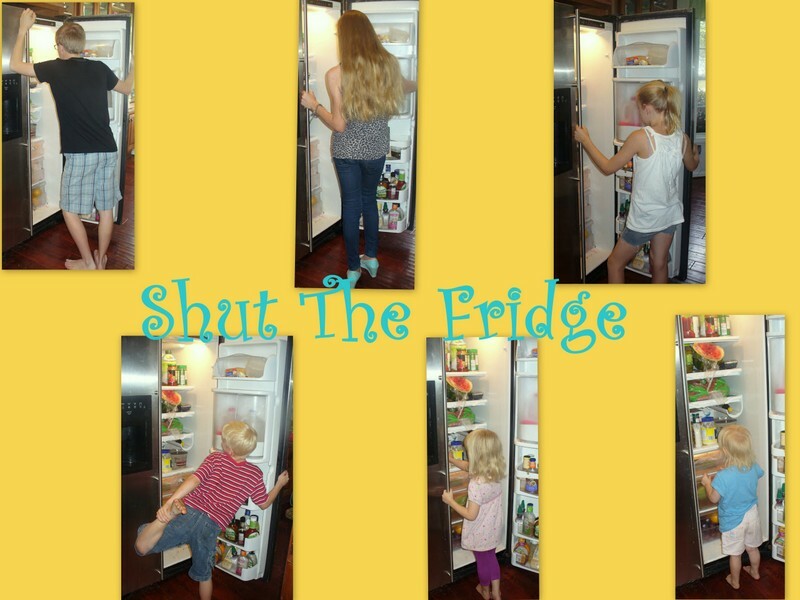 This, to me, is a completely brilliant idea for the homeschool community. Completely brilliant. Because, yes, we homeschool parents do occasionally fear that we are missing something, or not challenging the kids enough. But, with the fear comes confusion too, because even though we may be afraid that we are missing teaching them something.....we don't really know what it might be...or where to start. That is why this is such a brilliant product to offer. Feeds right into the fear, but gives us a solution too. She started by taking the series of placement tests. They are mini tests that cover all the major concept areas....then, based on her results, it created a lesson plan just for her. 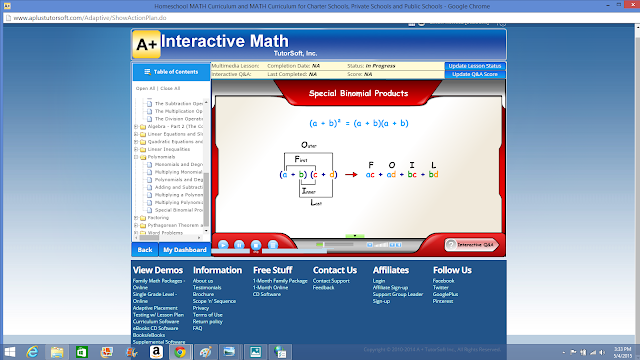 That was one of the coolest things about A+ Interactive Math. That is wasn't just a generic...."Hey, you are in 7th grade...this is the math you are supposed to do." Instead, you really get a "Hey, it doesn't matter if you are really smart in this area and also slightly behind in this other area....and right in the middle on this stuff....here is the math you need to do." I was hoping that after L-girl took the test her results would be that we were doing awesome and that she had no true gaps in her education. But, as I had already suspected, she did have a few gaps. Not a lot, but they were there. But, no big deal. No reason to panic or think I was screwing up my child's education....forever....or some other totally overly dramatic parental statement that we homeschoolers sometimes make! Because, those results were followed up with an individual, targeted lesson plan designed to close her gaps. So, after L-girl took her series of placement tests (about 14 mini tests on the different concepts), she just logged into her lesson plans and did her work a few times a week. 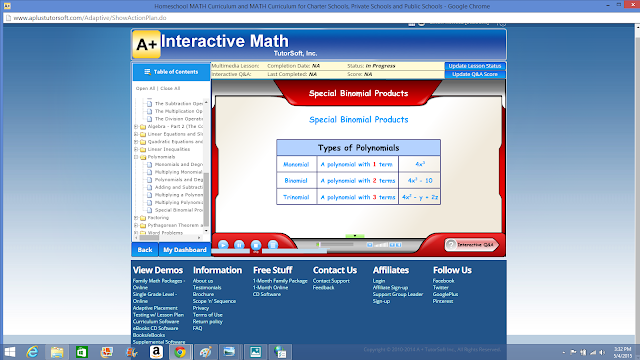 The lessons consist of a lecture type lesson with visual aides, sound effects, colors, etc.. My first, gut reaction, when I sat through a lesson on polynomials with L-girl was that I think I could have done really really well with this program back when I was learning algebra. Again, I never know if it is my age or the fact that I am so removed from Mr. Anlauf and the paralyzing fear of my formal algebra education. But, I get it. Now. I didn't back then. 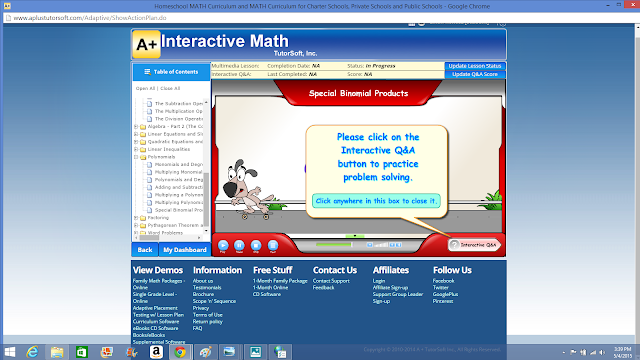 A+ Interactive seemed to make things easy to tackle and broke them down into identifiable chunks of information. After the lecture lessons, you have access to worksheets so you can practice what you have learned. I asked L-girl if she felt like this program explained things better than Rainman and I did. She said that she didn't think so, but, noted that they did sometimes explain it different than we did. I suppose that could be both a good thing and a bad thing. I asked L-girl if she liked this program or felt it was different and unique. She just said, "Well, it is math. So, I guess it isn't any different. It just explained how I was supposed to do something. Then I just did it. Regular, old math." Again, looking to drag things out of my teenage daughter. I asked her if she liked A+ Interactive Math. She said, "I guess. (long pause) I didn't dislike it." So, there you have it. A glowing recommendation from my 13 year old daughter. She didn't dislike it! HA! Her indifference aside, I still say the best part of this is that it enables you to identify potential learning gaps in your student and then address them. After that, it might just be "regular old math" to your student, but the stuff that they need covered or to spend extra time on, is what they are actually learning. That has got to be a good thing. If nothing else, it gave me peace of mind that I don't necessarily have when we are just winging it. You know? Click here for find out the top 12 reasons for doing the adaptive placement test and individualized lessons. A+ Interactive has some free stuff available for you, even if you aren't ready to commit to a subscription. They are actually having sale right now on both their Family Math and their Adaptive Placement stuff! (50% to 71% OFF). So, do yourself a favor and at least go check it out. 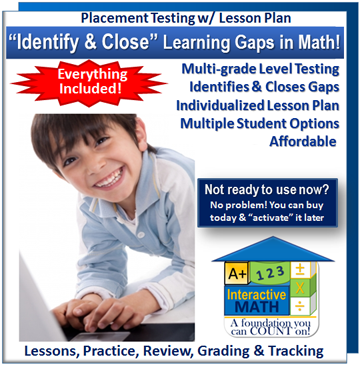 During the sale, the subscription for the Adaptive Placement Test is $29.99 for one student. Not too shabby for a little homeschool peace of mind, right? See what other TOS Reviewers thought of A+ Interactive Math. Some of us got to try out the Family Math plan.